POINCIANA -- It's expected to be a showdown for one of central Florida's largest homeowners associations. Some board members for the Association of Poinciana Villages recently took emergency action to fire the property managers over concerns money may have been mishandled. Channel 9's Nancy Alvarez spoke to residents about the changes they'll demand at Friday's meeting. 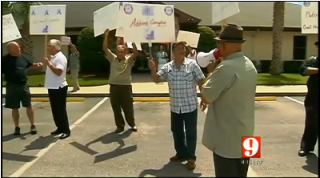 Residents spent the day protesting property management company First Service Residential, alleging the company mishandled millions in HOA dues. "This the tip of the iceberg," said protester Val Ramos. "We don't know how much there is, because we don't have access to those records." Those claims are now headed to court. 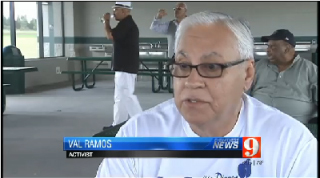 "We don't give the people words, we give them facts and evidence," said Ramos. "We'll provide them documents that will uphold the actions we have taken. Those actions by the board president and the HOA's executive committee include firing the property manager and transferring $1.6 million in HOA money to a new account. Now both sides are going to court vowing to fight for control. First Service Residential has denied any wrongdoing.